We sell Fiberlock's line for lead paint encapsulation and barriers including Fiberlock LBC Lead Barrier Compound (5801) and Fiberlock Lead Shield (5470). This is a product guide to help you determine which encapsulant is best for your project. If you are ready to buy, hit the button to head to our webstore. You have some choices when it comes to containing the hazard of lead paint. Encapsulation, or completely sealing in the lead paint with a coating that the toxic lead cannot permeate, is one choice. For that, you should use Fiberlock LBC Lead Barrier Compound, a high solids water based copolymer that meets or exceeds all standards for lead paint encapsulation. It leads the lead paint encapsulation industry in creating a barrier between lead paint and the environment. You can also choose to remove the lead paint with a specially formulated paint stripper. If you choose to do this, you will still need to 'lockdown' the remaining lead dust particles. For this, you use Fiberlock Lead Shield, a 100% acrylic post removal lockdown coating. Check out our lead paint encapsulation product guide below! 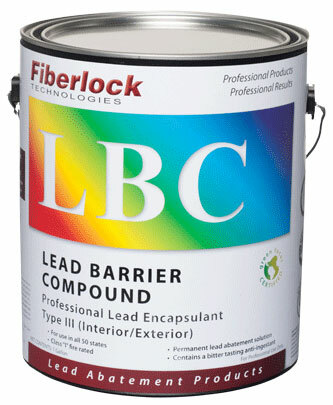 • Fiberlock LBC Lead Barrier Compound is a lead paint encapsulant that is high-solids, elastomeric-thermoplastic, water-based copolymer that meets or exceeds all projected federal, state and local standards for encapsulating. Blended specifically to form a durable and flexible encapsulant barrier between lead paint and the environment. LBC has been independently tested to the ASTM E-1795 requirements for Category III (Type III- Interior/Exterior) encapsulants. 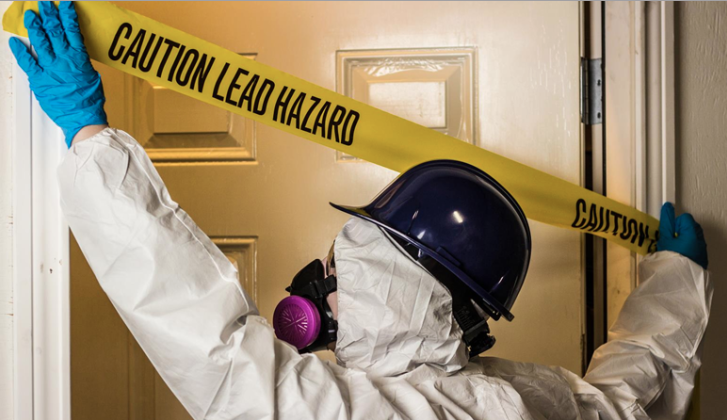 E-1795 is the principle performance standard required, adopted and/or incorporated by reference into lead paint abatement rules and regulations at the federal, state and local levels. Fiberlock Lead Barrier Compound has been certified by Massachusetts (No. DL-12362), authorized by the states of Connecticut, Ohio, New York, Maryland, Minnesota, and Colorado. LBC is accepted for use in all 50 states. Fiberlock Lead Barrier Compound has also been classified by Underwriters Laboratories (UL®). LBC is environmentally friendly and complies with all federal and state VOC requirements. • LBC contains Bitrex®, a bitter tasting, non toxic, anti-ingestant to discourage oral contact with lead paint. The required minimum 7 mil dry film thickness of Fiberlock Lead Barrier Compound offers unparalleled interior and exterior coverage and economics. In addition, the lower film thickness reduces stress on the existing paint system and maintains architectural detail. • LBC can be successfully applied to the proper thickness in one application with most major brands or airless spray equipment. This lead paint encapsulant can also be applied by brush or roller. LBC Type III can be used for application with surface temperatures as low as 38°F. 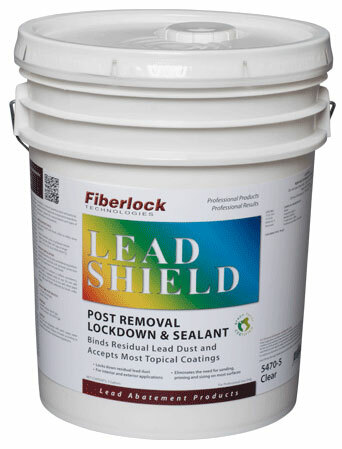 Fiberlock Lead Shield is a water based 100% acrylic lockdown with a dual purpose; it binds residual lead-based paint and dust present after removal; and accepts most topical coverings. The clear version of this lead paint encapsulation product sprays on white and dries clear to permit visual inspection of any residual paint. The translucent blue tint speeds up the post removal inspection process after the product has fully cured. The blue tint is advantageous because it enables an inspector to quickly identify areas that lead based paint has been removed from and subsequently locked down. These unique features assist in obtaining final lead based paint removal certification. Lead Shield is a one step product which bonds to most surfaces eliminating the need for sanding, priming and sizing recently stripped walls. Lead Shield can be used on both interior and exterior surfaces, and was expressly formulated to prepare these surfaces to accept a final topical covering. Lead Shield should not be used as a substitute for encapsulation.